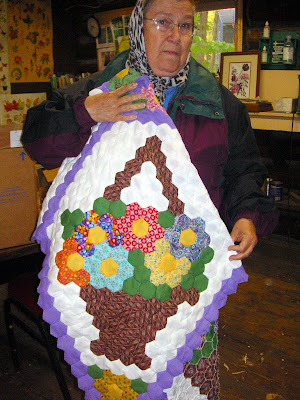 This is the quilt she is making. I'm posting on this site also so my sister will see what Sharon did with Mom's material. 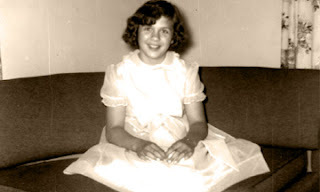 Remember those boxes and boxes of sewing, handwork and craft supplies that we didn't know what to do with, Peg? I gave them to Sharon, who lives in subsidized senior housing, and she was going to get "the old ladies" interested in doing something. And here is what Sharon did with some of the material. I instantly recognized the fabric and that brought a big smile to Sharon's face. Sharon has had a rough life. I suspect she doesn't know how to read and she doesn't drive. She never worked outside the home until her husband became terminally ill. She works at the site through a federal government retraining program for the elderly. Despite some health problems, she works hard at a hard job. And she finds time to serve on the housing board as a resident representative, volunteers at her church and creates masterpieces with her needle and thread. My usual source of apples, my brother Tim, had a poor year, so I stopped at an orchard on the way home from work earlier this week. I bought Cameos and MacIntosh and then sorted through a bin of "seconds" for a large bag of Honey Crisps at only 50 cents a pound! I already had a few Jonathon apples, so I set up a taste test to discover which apples were the best for freezing. I usually fry the apples and then freeze them. I leave the skins on the apples, cut then into thin slices and fry in butter until partially cooked, and finally add brown sugar and cinnamon to taste. When thawed, it should resemble chunky applesauce unlike anything you can buy. Both the Jonathons and MacIntoshes turned into mush. The Jonathons had the desired underlying tartness, but the MacIntoshes were tasteless. The Honey Crisp were a delightful surprise. I think of these as eating apples, but they held their shape and had a wonderful taste. I didn't cook the Cameos, but I will try them this weekend. Oh, and I'm stopping back at the orchard to sort through that bin of Honey Crisp again...if there are any left. 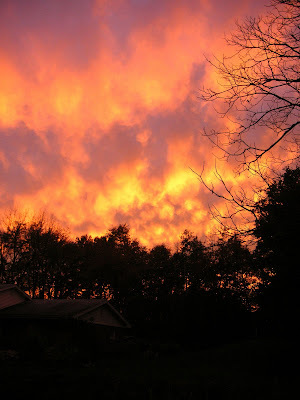 We were cleaning brambles out of a clearing in the woods and planting some trees when the sun set this evening. This photo has not been modified. It was just awesome. 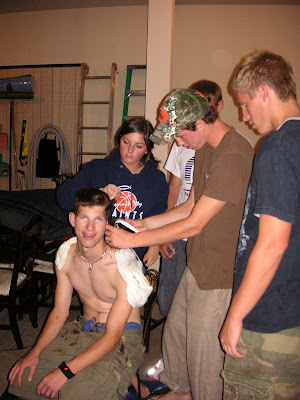 Then as I was browsing some blogs I frequent, I saw a similar photo, which was just awful. I can't imagine the horror of a firestorm. Despite the best efforts of the team, which included Ricky getting a Carroll Charger lightning bolt shaved into his head, the boys soccer team was stopped at the regional final game. Meanwhile Ron's activity in Jazz Choir is gearing up. He just joined this choir his senior year and he really enjoys it. The choir sang several numbers at the fall concert last Friday and were very good. Ron will be attending a two day workshop at Butler University next week. Go Chargers! 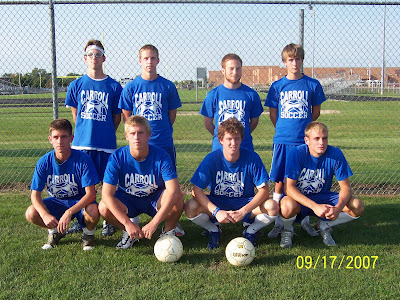 The boys won the soccer sectionals today and will play Wednesday night in the regionals. Ricky noted that they were only 4 games away from the state finals, but I reminded him that the only game that mattered was the next game. We won the first game last night against Leo, so play in the championship game on Saturday against Bishop Dwenger, always a tough team. Ricky was put in during the last 2 minutes and had a perfect set-up for a goal with seconds left, but he missed it. The crowd went crazy with Ricky's near goal. 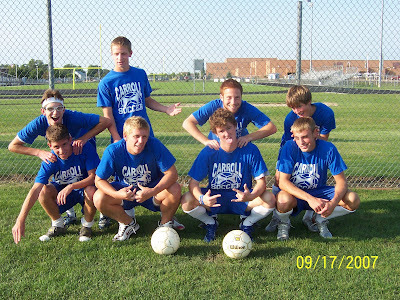 Here are the seniors on the team. I can always spot Ricky on field, with his rec specs and headband. 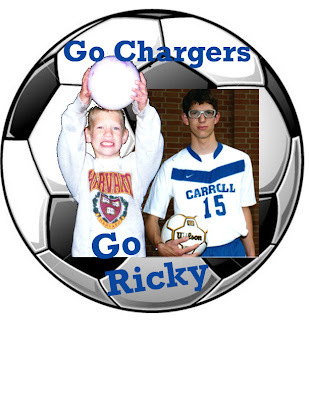 There is also a picture of the "round" I created for Ricky's locker this week as they gear up for the tournaments. 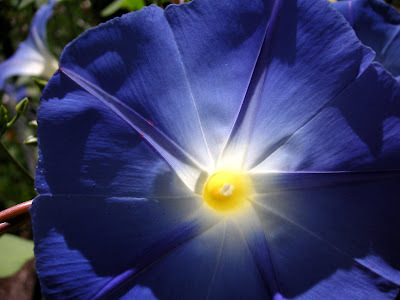 From my previous post, you may guess that I like morning glories. So much beauty from a small pack of seeds. 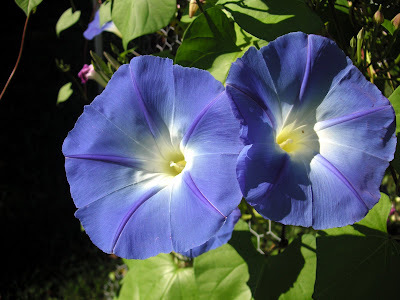 I planted them around the garden, along the fence row by the road and in front of my bay window to create a green and blue curtain from the inside. 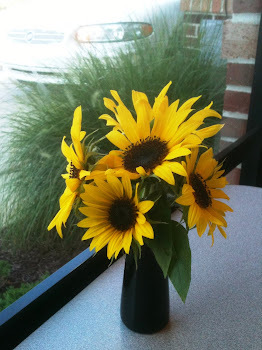 They remind me of summer days, with the hot yellow sun and bright blue sky. The blooms are almost luminescent, depending on the sunlight and I can get lost in the center. My parents always planted a huge garden and the pantry and freezer were full of homegrown food to feed a family of seven all winter long. (I'm the second oldest.) They also raised chickens and an occasional pig. 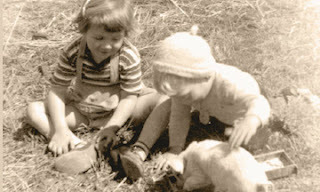 I started helping at an early age, whether planting seeds or tending a baby pig. But it wasn't all work on the Bishop homestead. 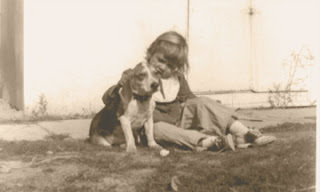 I played with the dog, hung by my knees, and even dressed up in a crinkly bright yellow dress. 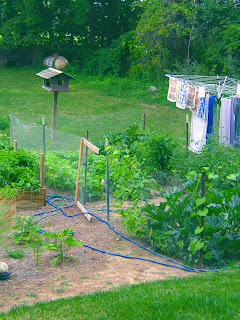 My garden memories center on long hot days picking green beans, sitting on the front porch shelling peas, cutting corn from the cob in a steaming kitchen and running tomatoes through the juicer. 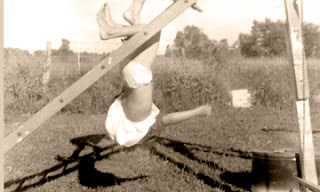 My sister remembers Mom bribing us to work by promising to take us to the lake to swim once we finished. I suspect now that it was as much for her to cool off as for us. So as an adult, I gardened, just not vegetables, other than a few tomato plants and some herbs. But I couldn't just let this prime soil go to just beans and tomatoes, squash and potatoes, eggplants and peppers. 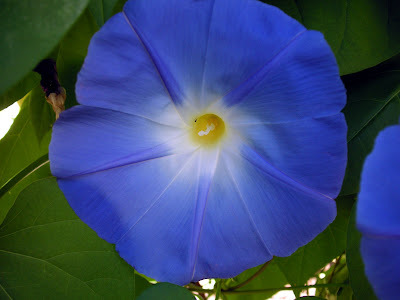 I decided that the fence must be disguised with morning glories. 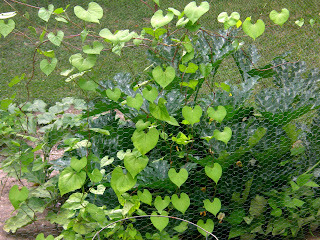 It worked just fine for most of the summer as you see the morning glories on the fence in front of the squash. 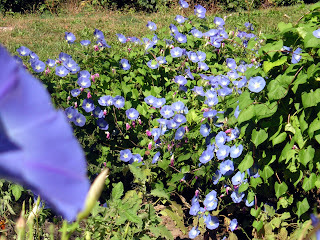 Then the morning glories came into their own and overran my little garden patch. How did I miss September, one of my favorite months? Not in real life; it was full. But not a single post on either blog. 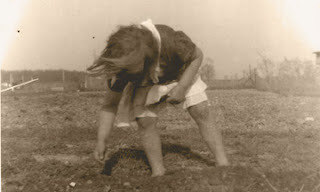 Maybe I'll catch up on the posts I meant to write, such as my new adventures in vegetable gardening. I picked the last (perhaps) eggplant, peppers and tomatoes last night and roasted them along with onions, garlic, basil in olive oil. It tickles me that Ricky raved about the dish. Ricky was a failure-to-thrive baby, who would hardly eat anything when we adopted him at about six years of age. Now he raves about roasted eggplant and is studying culinary arts. So there is hope for you mothers of picky eaters. Several weeks ago an adolescent boy in line behind me at the store asked if I just got off work. "Yes, did you ask because I'm so dirty and this logo on my shirt?" "No," he said, "because there is a praying mantis in your hair."